Doctor Who: Companion Pieces - Nyssa of Traken | Warped Factor - Words in the Key of Geek. 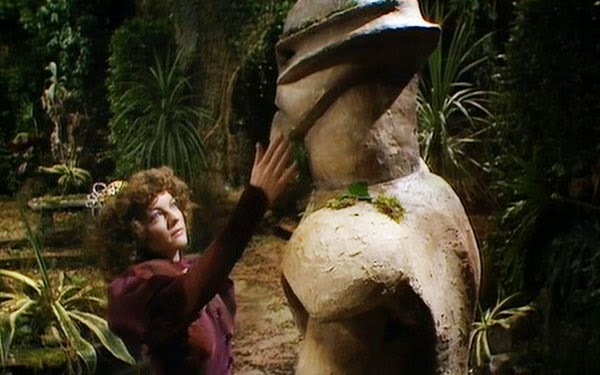 Nyssa of Traken is, on the surface of it, one of the least likely travelling companions the Doctor’s ever had. Polite, quiet, calm and with a sense of aristocratic orderliness that would rarely interrupt a fly, let alone kill one, she doesn’t enter the Tardis of her own free will, or by virtue of her own curiosity – she’s scooped up from a dying world and essentially dumped on the Doctor and his other, more temperamental companions as a fait accompli. People talk of her time as being the era of the ‘full Tardis’ and Nyssa does very often feel like the ‘good middle child’ – the one who eats all her dinner, does all her homework, is adored by teachers and largely ignored by her siblings as first Adric and Tegan, and later Turlough and Tegan bristle with quarrelsome energy and snap at one another. 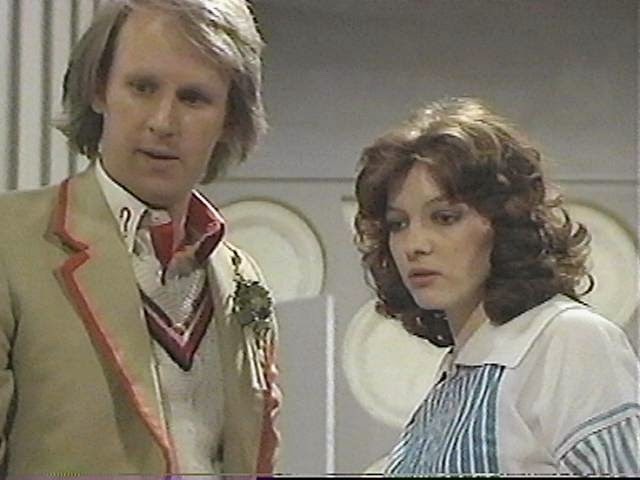 Peter Davison has always said – perhaps in a desperate search for a quiet Doctoral life – that Nyssa was the Fifth Doctor’s favourite companion, expressly because of her lack of histrionics, and that if he’d only been allowed to keep one of them, it would have been Nyssa. It’s a little odd to imagine being Nyssa. All the Doctor’s companions at the time had an ‘orphans of the storm’ quality – Adric had lost his brother Varsh, Tegan her Aunt Vanessa, Turlough was an exile from his home world, his family scattered, but Nyssa, of them all, had lost the most. The tranquility of the life she’d known was shattered by the Master, then she was taken away from everything familiar and dumped with an alien who promptly regenerated into somebody else. Then her whole world disappeared, destroyed with little ceremony and almost as little remark, and the ultimate horror confronted her – the man responsible for the destruction of everything that made her who she was now looked back at her, spoke to her, chuckled and cackled and ranted at her - with her father’s face. Her father’s voice, stolen from him, turned into a mark of universal infamy. Her father, the good, the kind, the clever Tremas, now known and cursed everywhere, as the Master uses his form and his image to prolong his odious life. Imagine the trauma of that for just a moment. Then consider Sarah Sutton’s somewhat glacial performance – always the logician, the diplomat, the peacemaker – it’s a study in aristocratic breeding, that mask that never slips, no matter what’s going on inside. The evidence that there’s something going on inside is not perhaps hugely strong if we only look at Nyssa’s on screen life. In an overcrowded Tardis, there’s rarely room for the mask to slip, and, while always being prone to the Master’s commands because they come from that face, Nyssa gets on with the life she has, unable to affect the lives of those on Traken, but able, in the here and now, to make a difference, whether it be building android-shakers, explaining recursion, or designing bodies for Urbankans. She does, always, what she can, and she always finds something to be able to actively contribute. That, if anything, is the mark of on screen Nyssa – finding the way to make even a small positive difference to a universe it would be all too easy to curl up and ignore, or resent, or scream at. It’s perhaps telling that the biggest character moment for Nyssa in her on screen life is in the only story where she, however briefly, gets the Doctor all to herself – Arc of Infinity. 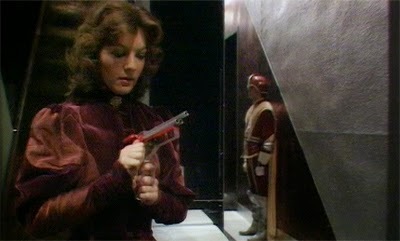 There, when the Time Lords, however well-meaning, threaten to take from her the father-substitute she has begun to cling to – the Doctor – Nyssa’s personal need comes roaring to the fore and overpowers her good-girl instincts, letting her grab a gun and demand the Time Lords pervert their idea of justice to keep the Doctor alive. When he, of all people, persuades her their way is for the best, her reaction devastating – she hands him the gun, but she cannot look at him. It’s as though, after everything she’s lost, she’s invested her life’s meaning in her relationship with him, and now he has betrayed her too, knowing she’ll be alone without him, and not caring that she might not be able to cope. There were less in the way of story-arcs in the 80s than there are these days, but it’s also telling that Nyssa leaves just three stories after this. She’s lost so much, including Adric, and the moment in Arc of Infinity is oddly resonant with the moment between the Twelfth Doctor and Clara in Dark Water where Clara tries to make him do as he’s told by threatening to throw away the Tardis keys. He proves in both cases that ultimately he will do what he must, not what they want, and so it’s as though Nyssa, internalizing this new understanding, decides she must live for a purpose that gives her meaning in and of herself, rather than through connection to a single other individual. It’s an odd, mature moment when the middle-child grows up. And so, though there’s little in the way of excuse for her faffing about Terminus in her smalls, when she’s always been rather buttoned up (notwithstanding the Downton Abbey sense of ‘I’ll show you’ fun that lets her dance the Charleston in Black Orchid, just to invert Adric’s understanding of her), when she decides to stay on board and find a cure for Lazar’s Disease, we’re somehow not surprised. It makes sense within the character we know – she’s a young woman without a planet, without a family, without anything to cling to except her own sense of what must be done. And so, having found a big way to make a difference in the universe, she trades in her thousand little deeds with the Doctor for a life of clinical research. Except of course that’s no longer the end. Nyssa’s story-arc has grown in recent years through the Big Finish audio range, to make her far more interesting than she was ever really given the breathing space to be on screen. Now, in the world of audios, there are two Nyssas. There’s young Nyssa, the Nyssa we know from the screen. And then there’s older Nyssa – just weeks after they left her on Terminus, the Tardis crew find her again, some fifty years older in her own personal timeline, and with children. The older Nyssa takes up where the younger Nyssa left off, probably confusing the heck out of Tegan and Turlough with the change in her experience - imagine you left a pal at the office for the Christmas break, and came back in the new year to find them fifty years older! The audio stories though have given Sarah Sutton the opportunity to add some depth and backstory to Nyssa’s character. Sometimes travelling alone with the Fifth Doctor (presumably in the pre-Arc gap), and sometimes in a still-full Tardis, she has had the time and the storylines to break free of the simple aristocratic mold in which she was cast. 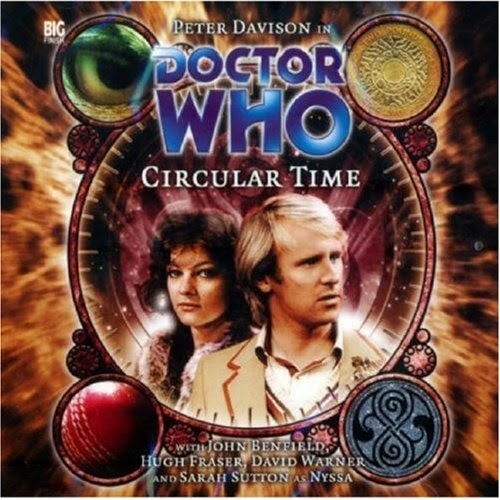 In particular, Circular Time is a fascinating disc to get hold of – it’s four short stories, but in one of them, we see Nyssa’s first love, including a scene that would never have made it into 80s Who. The fourth and final of the Circular Time stories is extra-special, and there’s no way of telling you about it without losing some of its magic. Suffice it for now to say that it explains a lot, not so much about Nyssa, but about the Fifth Doctor, and to some extent even the Sixth. Older Nyssa is also able to do things you somehow can’t imagine young Nyssa doing – in The Butcher of Brisbane, the Talons of Weng-Chiang prequel, for instance, she makes a life for herself as Magnus Greel’s fiancée and is more than a little responsible for feeding his terminal paranoia. It’s worth catching up with Nyssa on audio, if only to learn what 80s storylines never had the time or storytelling nous to tell you. Ultimately, Nyssa has more claim to being a friend of the Doctor’s than any of the companions with whom she shared the Tardis. With less mentoring than was required with Adric, and less umbrage than Tegan frequently took about the universe, she is in some ways a glimpse of the Doctor early in his own life – privileged, calm, content – until he’s not any more, and has to define his life by the value it can bring to others. Nyssa may have been the quiet middle child in a chaotic Tardis, but she tells us more about the Doctor than any of the others do. When we leave her on Terminus, she’s stolen her Tardis and run away from a home that isn’t home any more. In a universe determined to give her no say in what happens to her, on Terminus, she finally defines her life for herself.